Your special day is our priority, and our friendly, professional staff will help you to make it just that. Choose from our extensive range of styles and colours and we will help you complete your unique look with our wide range of accessories. Tissimans offer individual viewings and fittings to couples looking at wedding wear to ensure you have the best experience possible for your special day, please contact us or come in store to see out full collection. We have our own collection of traditional morning suits, dinner suits, prince Edward jackets, and many other styles are available. To accompany this there is a full range of accessories including waistcoats, neckwear, handkerchiefs shirts, hats and many more. 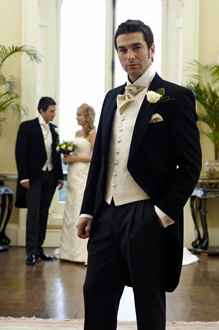 We have a full range of dinner suits and evening wear to suit your every need. Including evening tails. Accessories from wing collar shirts, waistcoats, cummerbunds and bow ties are available to accompany your outfit.